The cold weather on Friday didn’t stop the Thunderbirds, who were on fire in their second match against the Manitoba Bisons at War Memorial Gym. Unlike the game on Thursday, the Thunderbirds took down the visiting Bisons in only three sets with set scores of of 25-20, 25-17 and 25-15. The victory guarantees the T-Birds a spot in the Canada West semifinals next week. For the T-Birds, their quarterfinal against the Bisons may have been good practice for what’s to come in playoffs, as the tight defensive wall set up by the Bisons was hard to get by all weekend. Although UBC jumped out to an early lead at 10-6, the Bisons quickly caught up within two points with strong blocks at the net. But the T-Birds were able to take advantage of their excellent service and launched an incredible eight-point run which put them comfortably in control. The T-Birds Team Captain Irvan Brar put up three aces in a row which boosted the momentum of the ’Birds and helped them claim the frame at 25-20. 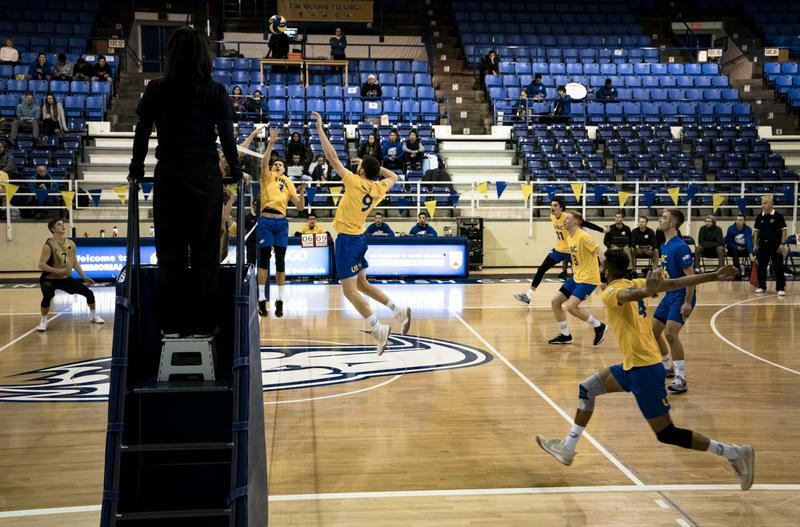 “It's been definitely a part of our identity ... the strength of our serving,” UBC head coach Kerry MacDonald said. Not only did they manage to command the serving, but the T-Birds also found a way to break though the defence of the Bisons in the second set. Clean execution of their game plan kept the team focused and in system for the night. With less errors and a higher hitting percentage than Manitoba, the ’Birds put up their game high 17 kills. Together, UBC finished the set ahead 25-17. Having found their rhythm in the second set, the Thunderbirds started to put on a show in the third frame. Veteran setter Byron Keturakis contributed seven out of eight service aces, which helped the T-Bird to a six-point run and to settle a lead at 10-4, which they only expanded through the end of play to 25-15. Together, the T-Birds put up 16 aces, 40 kills and 22 digs on the night. When asked about the team mentality entering into the semifinals, MacDonald said the team is excited to face some greater challenges.